The Civil Rights movement happened, thank goodness…according to text books and laws in the 1960’s. But it’s very clear that the civil rights movement needs to continue moving. It’s a red tape war, for the most part, at this point. And it’s the laziest most subtle offensive actions taken through employees of institutions. Red lining was a term coined in the 60’s by a community activist named John McKnight. “The government-sponsored Home Owner’s Loan Corporation first drafted maps of American communities to sort through which ones were worthy of mortgage lending. Neighborhoods were ranked and color-coded, and the D-rated ones — shunned for their “inharmonious” racial groups — were typically outlined in red,” wrote Emily Bagar for the Washington Post in her article Redling: Still A Thing. As in, those red areas were CREATED on purpose by the MEDIA, GOVERNMENT and FINANCIAL INSTITUTIONS. I’m burning red. Rightfully, people got really angry about these practices that put them at a great, a greater and greater disadvantage. 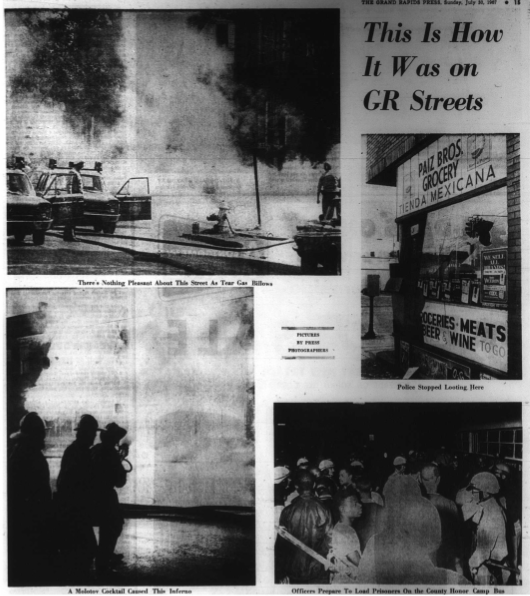 Boiling up in 1967, there was a (a lot of) race riot(s) in Grand Rapids. The spark that time: white officers pulling over black youth in their car and accusing them of stealing it, and eye witnesses say they used excessive force. Is any force necessary? Nearly 50 Years Later…Let Us Name The Force Of Disorder (Systematic Oppression) Appropriately. That spark started a wildfire…when over 320 arrests were made in 1967 in a 2 day period…July 25th-July 27th 1967…imagine how many families that affected…The news talked about the lack of male role models as the reason for the “inharmonious” youth…sound familiar?…to the 1930’s…to today? School-to-Prison-Pipeline, everyone. In a block between 131, Wealthy, Lafayette and Hall…still a predominately black residential area…people spoke up for their rights; as known as a riot. Were they heard? Can we hear them, please? The Kerner Report listed their grievances, an excerpt saying, “Our Nation Is Moving Toward Two Societies, One Black, One White—Separate and Unequal” Read more details here…And here are the grievances. Critical thinking caps on…Could that be a viable grievance today? Todd Robinson wrote this book called A City Within A City, which explains a portion of this history in Grand Rapids much better than summarized here. Green light: Click Here For FAIR Assistance In Getting Home, Sweet Home. Are you a prospective buyer when it comes to real estate? Or just generally and genuinely interested in all things real estate? Well then you’re definitely in luck, because The Complete Real Estate Site is going to be your number one pick of websites to go to. Whether you’re trying your buy your own home for the first time, or you’re trying to rent a home because you don’t want to commit, you might need some guidance. They have an endless amount of information on all things “rental” – For more information on home renting, click right here! They know the “in’s and out’s” of home owning – Want to learn more about buying a home? Go ahead and click right here. They can help you get your property SOLD – Learn how to sell your home fast, by clicking right here. They will give you the know how on all things real estate – Become a “Real Estate Guru,” and learn more by clicking right here. We weren’t kidding, The Complete Real Estate Site really does have it all! There’s no forms to fill out or any annoying hoops to jump through, all you have to do, is check it out for yourself. You can learn how to sell your home the right way, by clicking here. Interested in becoming a real estate investor? It’s easy! Click right here. Visit The Complete Real Estate Site by clicking right here. When it comes to purchasing anything, the best thing to do is to read reviews on whatever it is that you’re purchasing. Although it may seem extremely unnecessary, it’s only going to help you in the long run. Being able to read reviews and see what other people have to say can really help you come to a decision. There’s no better place to access all of this, than RTO Reviews. And many more! That’s just a couple of the many services this site has to offer a review for. Instead of going to Google and spending forever trying to find just the right site to tell you what you need or want to know, you can just visit RentToOwnReviews.com, and it’s a one stop, see all site! They really are! Reviews are typically what make or break certain things! Your favorite TV shows, movies, celebrities, and all of your favorite products. So if you spend so much time looking at those reviews, then you should be taking the time to look at the reviews of things that really matter, like home owning! Take advantage of this amazing site and use it to see all you need to know about any RTO service available. For another review on RTO Reviews, click right here! To learn more and check out RentToOwnReviews.com, click right here! The post RTO Reviews Has Only The Best Reviews appeared first on The Complete Real Estate Site. The post 6 Major Home Selling Mistakes You Should NEVER Make appeared first on Your Rent-to-Own Consultants. You’ve seen all the news about immigration, immigration law, Donald Trump and all of that — these are trying times in the U.S., and even worse times all over the world, and whether we like it or not, the United States is still quite the Land of Opportunity, hence why a green card is so essential to your survival. The survival of your family. Your future. You’d be shocked to know that back then 8.8 million of those immigrants were eligible to obtain naturalization status, the ultimate immigration goal! The overwhelming majority of those immigrants were actually able to receive a green card as far back as when they applied in the year 2000 or later. Let’s not forget just how intense the entire immigration issue is regarding refugee and asylee status in the U.S. — in 2013 alone, over 69,000 individuals received that status due to persecution in their own countries! The statistic should tell you something: that immigration is a valued commodity in the United States given the expanding economy; however, the process often can be characterized by a dartboard, a blindfold, and a hope and dream. Many immigrants hope for that dream and end up on the short end of the stick, having to jump through more hoops just to make it happen for their families. Why is immigration such a problem? Try Terrorism. The construction industry. Nay, the entire economy. An overwhelming workforce resides as the foundation for the bread-and-butter work of the country, complete with even better wages, and yet many able to work face illegal immigration status and deportation. Thankfully Own With Hope sees the bigger picture of the problem, and the beauty of the all-important green card, giving the hopeful immigrant that first step toward naturalization, is that everyone who wants to live the American Dream — and we do mean everyone, all colors, creeds and nations — should have that extra push. That possibility of a life worth living. Don’t get us wrong: going through the legal channels is important. You can find an ideal immigration attorney through this internet legal plan, for one, and take all the appropriate steps to obtain your green card. But in this day and age where our walls get thicker and thicker, you need all the resources you can get. Sign Up for This Green Card Program. Right Now. All it takes is less than a minute to fill out the information right here. Think. The possibilities are staggering. You could be one of those 13.1MM or more in the next year! There’s a reason why our national real estate market’s beginning to soar. There’s a reason why our real estate market’s a major value internationally right now. The goal is clear. Our job market’s steadily climbing. You are a hot commodity in this nation. Take advantage of it. Sign up for this program today. The post Getting Your Green Card Is Like Winning the Lottery appeared first on OWNWITHHOPE. Whether it’s a lever or a button, if it’s red, you know you could end up dead. Unless it’s an emergency, and you absolutely have to press that button! It’s a last resort. No turning back. Do or die! Exciting, isn’t it? They’re like emergency buttons. Or at least that’s how they’re supposed to be. We can read about all the must-do’s and should-have’s when it comes to credit cards, but here’s the thing — the single most important motto you must take with you is this: credit cards must be used only as a last resort. Against all better judgment, use your credit card as a last resort. If there’s an asteroid coming at you, and you’ve exhausted all measures to try and thwart the big, dumb rock, use your credit card as a last resort. If you have no money, no car, no clothes, no pizza, and no way back home from the Mojave Desert, and all you have on you is a credit card — then, and only then, you must use it as a last resort. When you think about it, it makes sense. This goes with all sorts of education under your belt, particularly when it benefits your credit repair regimen with Lexington Law. Of course, the experts there will tell you the same thing: prevent the future from collapsing on you and focus on emergencies only when using your credit card. That means if you can eat it, drink it or use it for your own benefit somehow, better hold off on pulling the plastic and wait until you have some good ol’ fashioned, cold, hard cash. You save yourself some trouble. That means if your car breaks down, and you don’t have enough cash immediately on you, go ahead and pull the Visa out. If a hurricane hits your home and pulls the roof off and you have to pay off a deductible, I would think it’s okay to get the Mastercard out. You see what I’m saying? Because you do have to remember one thing: when you contact the H.O.P.E. Program to consider owning your own zero-down home, know that your credit score will matter tremendously. You can’t have a good score, though, without actually using the credit card (or other lines of credit, whatever they may be). So practice this, above all else: responsibility. And don’t press that emergency button unless it’s absolutely necessary. Buying a Ferrari With Your Home Equity Loan: a Good Thing or Bad Thing? Fairly fun reason to buy that high-priced car, or boat, or maybe a brand-new beachfront summer home! All that cash you shell out would look nice on your 2-hour tax return, no doubt, and needless to say, that’s a great reward for your hard work in maintaining your mortgage payments right down to the day, every month, every year. You’ve seen the deal regarding emergencies, especially with credit cards. The problem with getting hit hard on the unexpected front is that, lo and behold, you’re still saddled with this one home equity loan for your zero-down home from H.O.P.E. to Own that you have to pay off, thinking, “oh, man, if I only had these funds to pay for my heart surgery or Lasik!” It’s unfortunate. Even worse, you might have that Ferrari traded in (or out of commission due to an accident you had because of your bad eyesight since you didn’t get that Lasik surgery), and you’re as healthy as a horse — and you’ll still have those equity home loan payments to make until you’re all caught up. That’s where a loan doesn’t seem so fun to have! That ‘free’ money matters so much, so do enjoy it — to an extent. Maybe you don’t need the Ferrari. Who knows. But just know that the home equity loan is there — for anything you want! And that, my friends, might be a good thing or bad thing as well.